While working my way up and down the Massachusetts and New Hampshire coast last week, I found several off-island Appledore gulls. Herring Green 42A. 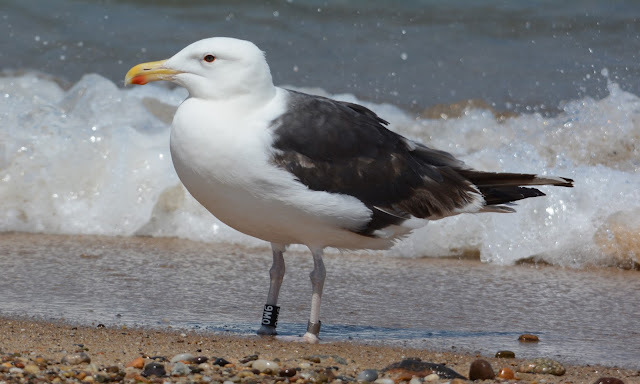 Banded as a chick on 18 July 2014. Seen here on 16 July 2015. Rockingham Co. New Hampshire. Herring Green U03 was banded as an adult on 29 May 2014. Seen here on 16 July 2015. Rockingham Co. New Hampshire. Great Black-backed BLACK 9M0. Banded on 16 July 2012. Seen here on 19 July 2015. Barnstable Co. Massachusetts. Seen here with its younger cousin, a first summer Lesser Black-backed. Above, BLACK 9M0 is undergoing 4th prebasic molt. By the end of the fall, we'll call this individual a 4th cycle - essentially an adult, or adult-type if sub-adult plumage features are present. All secondaries (?) and tail feathers retained 3rd basic. The 4 inner primaries, p1-p4 are 4th generation (4th basic) while the older, mostly black, outer primaries are 3rd generation (3rd basic). Note how big the p10 mirror can be on a 3rd cycle Great Black-backed Gull. The p10 mirror is not so apparent at this angle. Herring GREEN X82. Banded as a chick on 12 July 2013. Seen here on 19 July 2015. Barnstable Co. Massachusetts. Just as expected for a Herring born in the summer of 2013, this bird is undergoing its 3rd prebasic molt with 3rd generation inner primaries growing in. Note the 2nd basic tail, secondaries and outer primaries. Thanks to Bill Clark for providing these life histories!